Scott has always had strong ties to Georgia, particularly the Macon community. He was born in Augusta, grew up in Houston County and attended high school in Macon. He married his high school sweetheart, the former Jacki Frame, also a Macon native. After living in Alabama and Northern Virginia, Scott and his wife wanted to return to Macon to live near family members, and to instill their children with the values and provide them the same experiences that they had growing up. 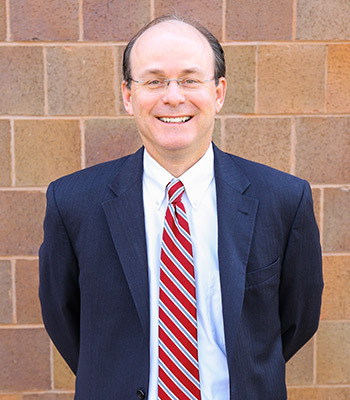 As Scott and his wife put it, “We are blessed to have had the opportunity to live, practice and worship in Macon for 18 years.” Scott was drawn to the practice of law because of his desire to help people; it is his belief that the services SPGG provides are an extension of his faith and offer the opportunity to serve others. He is dedicated to providing services that equal or surpass those found in metropolitan communities. Scott’s expertise in corporate and healthcare law, tax exempt organizations, affordable and low income housing, and wealth planning helps ensure that SPGG clients receive superlative quality services for their business and legal needs. When he is not practicing law or volunteering with the charities that SPGG serves, Scott enjoys golf, gardening and family time and activities with his two sons.